Digital marketing is a rapidly changing field affected constantly by technological innovations. Businesses must keep track of digital marketing trends for 2019 in order to strategize for the coming months. Modern enterprises need to invest significantly in creating a strong digital presence to expand their user base and improve their revenue generation. Approaching a web development company to get an interface is just the beginning. They have to know the methods to rank higher in all kinds of searches and engage their audience through social channels. Additionally, they must also be aware of how to leverage email marketing for their benefit and how to plan their display advertising strategy. Today’s customers log on to the internet for satisfying a majority of their needs. This makes digital marketing even more important for all businesses, large and small. Let’s take a look at the major trends which will affect the field this year. Two kinds of smart devices have contributed to the growing use of voice search. The first is the well-known smartphone which is driving modern-day internet usage. Smart speakers like Google Home and Amazon’s Alexa are the second type which is being used by people to conduct searches verbally. As more and more people start using these gadgets and instead of typing begin to speak into devices to search for a solution, brands will have to adjust accordingly. They will have to ask search engine optimization companies to optimize their web pages and other instruments for voice searches. Marketers are waking up to the benefits of data enrichment and this year will see them depending on the technique even more to make informed decisions. The technique involves fusing the existing information within an organization’s database with additional data from an external trustworthy source. This enhances the existing customer data and gives deeper insight to marketers into their audience’s behavior. They can use this better quality information leads that are more likely to convert. It will also help them in identifying the mode of communication that will be the best to connect with a prospective customer. Chatbots are playing a valuable role in improving customer services. They are also helping marketers engage their target audience in a better manner. Users are happy with bots as they get round the clock access to dedicated, interactive support. The integration of Artificial Intelligence and machine learning techniques in the architecture of chatbots will improve their efficiency even more. They will learn audience behavior through customer interactions and provide better help. Brands will then use the feature to make accurate suggestions which will encourage an existing client to make more purchases and new ones to convert. Chatbots will be one of the most visible digital marketing trends for 2019. Personalization has always been an effective marketing technique. With companies getting access to in-depth information, they will be able to create rich customer profiles. This will help them in sending promotional messages which have been customized according to an individual’s preferences. This approach provides a better experience to users which reflects in increased brand loyalty. Marketers will continue to use automation tools to automate promotional processes. One of the best examples of sending individualized messages can be seen in e-mail marketing. Companies are using software solutions to automatically segment their mailing list according to new parameters. They, then create separate custom content for all the different categories. The consumption of video content is growing by the day. People are looking at clips not only for entertainment but also for learning. Brands are using videos not only for promoting their products and services but also to tell clients how to use them. Product walkthroughs and how to visual guides are much easier to comprehend rather than text manuals with still images. In the coming days, expect to see brands trying to engage their audiences with live videos. They will show events like product launches or promotional concerts on platforms like company websites or video-sharing avenues such as YouTube. Live streaming content allows brands to engage prospective consumers in a better fashion and strengthen their bond with existing ones. Influencer marketing will continue to be an integral part of any business’ promotional strategy on digital channels. Marketers use social media platforms to promote brands as well as engage with the audience. Influencers are people who have remarkable experience in their industry or profession which has allowed them to build large followings on social channels. Brands will keep approaching such individuals in order to broaden their reach by accessing the influencer’s followers. 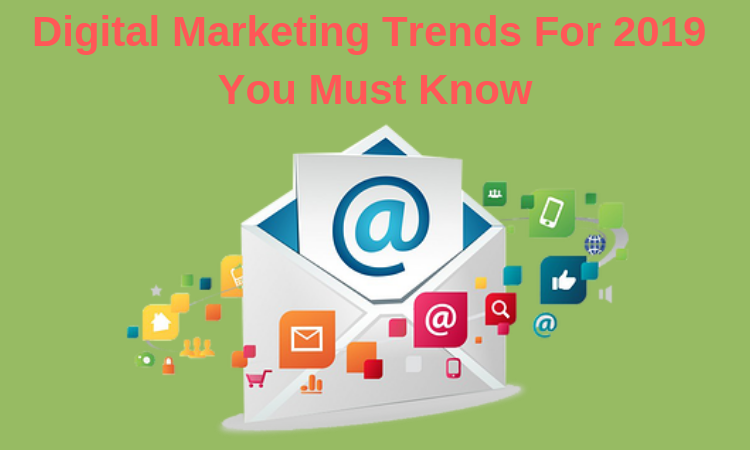 These are some major digital marketing trends for 2019 which will force marketing professionals to modify their promotional strategy. Businesses must keep these points in mind while formulating their marketing plans for the coming months. Jacob Graves is a Web designer by profession and he works for a firm which provides graphic designservices in Vancouver – FernWeb. He uses to write useful tutorials on Web design and socialize itsdifferent social media platforms. Previous articleTop 4 Tricks To Backup Outlook OST File To PST: Just Check Out Here! Jacob Graves is a Web designer by profession and he works for a firm which provides graphic design services in Vancouver – FernWeb. He uses to write useful tutorials on Web design and socialize its different social media platforms.